The first clothes, then perfume and now jewelry. 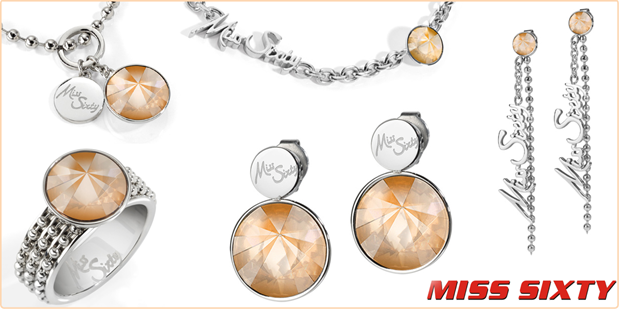 Miss Sixty It has launched its new line of jewelry, diversifying its product in the fashion market. This first collection is the result of the association between the Group Sixty, paradigm and the Group Morellato. Paradigm It is responsible for producing and marketing the jewelry, and it has been able to interpret the style and the icons of the Italian brand to perfection. In a first sample, there are six different themes that are born to complete the look Miss Sixty. The pieces have been designed with materials as the steel, with baths in rose and yellow gold, Crystal, quartz, or even diamonds, that you have been treated with very innovative techniques. Butterflies, wings and coins they are some inspiring reasons of pendants, rings and earrings with multicolored pieces, fun without losing sight of the latest trends in fashion. Another gift to surprise this Christmas. Certainly, if the girl is a fan of Miss Sixty, be safe right. The garment are his pants, since they feel great and the girls make them a very attractive rear. Since its creation in 1991, the Italian brand has become one of the most popular in the young fashion sector and its expansion not to.